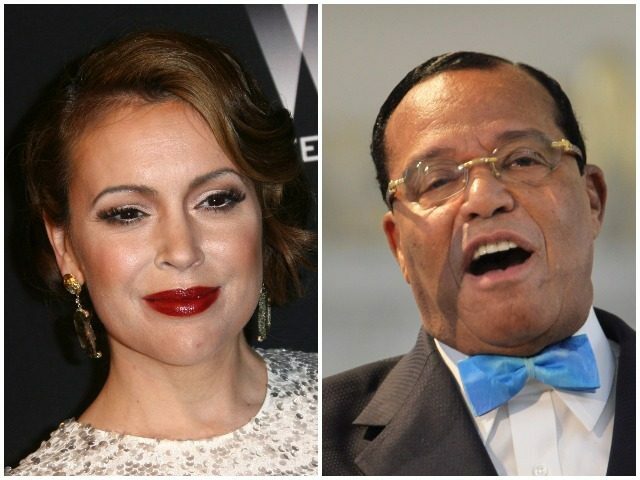 Actress and liberal activist Alyssa Milano distanced herself from the Women’s March in a recent interview, citing concerns over the group’s leaders’ connections to anti-Semite Louis Farrakhan. “Any time that there is any bigotry or anti-Semitism in that respect, it needs to be called out and addressed. I’m disappointed in the leadership of the Women’s March that they haven’t done it adequately” Alyssa Milano told The Advocate. The activist was also asked if she would attend a Women’s March event now, considering the ties that the leadership have with Farrakhan. “I would say no at this point. Unfortunate that none of them have come forward against him at this point. Or even given a really good reason why to support them,” she said. Tamika Mallory and Linda Sarsour, key organizers of the Women’s March, have been criticized for their associated with Nation of Islam leader Louis Farrakhan. “The Jews don’t like Farrakhan, so they call me Hitler. Well, that’s a good name. Hitler was a very great man,” he said in 1984. During a recent appearance in Iran, the hateful minister chanted “Death to America!” and “Death to Israel!” in Farsi.